Michele Bachmann and Sarah Palin draw a lot of comparisons but there's one thing that's not really comparable between the two: their poll numbers. While Bachmann and Palin have similar numbers of voters with a favorable opinion of each of them, Palin's negatives in seven states we've polled over the last month are an average of 18 points higher. And while Bachmann's performance in those states against Barack Obama would be pretty much on par with how John McCain did in 2008, Palin does an average of 6 points worse than McCain did. In the long run as voters get to know her better it's possible Bachmann will become just as unpopular as Palin, but for now she doesn't have nearly the same amount of baggage. -Bachmann does better than Palin against Obama in all seven states. Obama won the states by an average of 6 points in 2008 and Bachmann basically matches that, trailing by an average of 7 points. Palin meanwhile would be the biggest Republican loser since Barry Goldwater, lagging in this set of states by an average of 12 points. -Bachmann and Palin both average 35% of voters with a favorable opinion of them. But 58% view Palin negatively compared to just 40% for Bachmann. Bachmann's certainly not popular- but the door is still open for her with a lot of voters where it's pretty much been shut on Palin. We're still finding in a lot of our polling that Palin is the most well liked potential GOP contender with Republican voters, even if she's not their top choice for the nomination. But Bachmann is more well respected and far less toxic, at least for now, to Democrats and independents. Either would probably be a disastrous nominee for the GOP, but Palin is on a whole different level from Bachmann. Palin is overexposed for a few years. Bachmann is the new "shining object" that voters want to play with. Should Bachmann actually win the nomination, Obama is going to hammer Bachmann for her past remarks and extreme pledges that she signed on to. I expect Bachmann's national numbers to decline to her MN numbers. Public Policy Polling has Bachmann's favorables in MN to be +33 / -59. This just proves that Republicans don't really believe in the "not conservative enough" myth. It also indicates that we are not seeing a 2010 electorate at this point. If we were, Republicans would be denouncing Romney as a RINO and Bachmann would be ahead of Obama in national polling, not struggling to win the nomination. 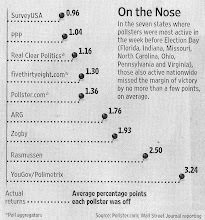 PPP's weekly polling shows Tea Party self-identification in a slow, but steady, decline. Down 6 points from April, and we have a long way yet to go before the election. "possible" is an understatement. When voters get to know Michelle Bachman they will run screaming. She actually even crazier than Palin. Michele Bachmann as GOP nominee would be a dream come true to me. But I still think it's highly unlikely because there's still a long time until the primaries - her insanity will be too obvious by the primaries for her to get the nomination... unless the average GOP voter is really that far off the deep end. I personally prefer Palin over Bachmann simply because I believe palin has the political toughness that will most certainly be necessary to battle the liberal mindset in politics in these times. Turning this country and our economical situation around will require whoever wins to set policies that will take us back to some of the morals set forth by our forefathers and be strong enough in their belief in those policies to resist the easy path and caving in to special interest groups and the left. Some of these special interest groups will stop at nothing to overcome conservatism and it will get psychologically rough for the winner of the Presidential seat. I like Bachmann for the most part but fear that she lacks the tenasity (sp) to stick to her guns where policy is concerned whether it be resistance from liberals from the right or from the left. It will be a bumpy ride for whoever wins but I am most certainly convinced that ANYONE other than Obama will be the best choice for the country and our future. I have not really investigated the other candidates sufficently to rule any of them out at this time. However, their policies will come to light as time grows closer to election day. We must ALL do extensive research into each candidates historical policies AND their stances on the solutions to our problems as a country as well as the voting records of those who have been involved in politics in the past and present. Their voting records will not lie, no matter what they tell us they believe and support. A leopard does not change it's spots. Each voter must search their consience and the consience of their candidate before deciding who to cast their vote for this time. I believe that this election is probably the most important election this country has ever experienced and NO ONE has the privelegde or the right to cast even one vote without knowing who they are voting for and what they will do with the Office of the Presidency. Having said that I must add that it is also extremely important that each and every one of us must fulfill our responsability as citizens of this great nation and cast our vote for the candidate of our choice. That is what makes this country the great country that it has been in tough times in the past and will be again in the future. We can't afford to make mistakes as tremendous as the mistake we made electing Barack Oboma. If we do we are history as a world leader. I believe there is a strong correlation between not using paragraph breaks and being a lunatic. See Benny as an example.